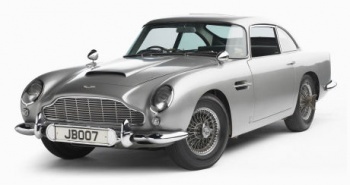 The car used in the classic Bond films Goldfinger and Thunderball just sold for Â£2.6 million. The Aston Martin DB5 that Sean Connery drove as James Bond in the 60s is one of the most iconic vehicles in the world. The 1964 model was especially fitted by the Aston Martin factory for use in the films. Modifications made by special effect guru John Stears (Star Wars, Chitty Chitty Bang Bang) include front machine guns that shoot blanks, an ejector seat that is no longer functioning, radar navigation, a nail spreader, tire shredders, bullet shield and a revolving license plate. Bond's Aston Martin DB5 has just sold for 2.6 million pounds sterling or around $4.1 million. Owning the car is a dream for any Bond fan. "It's a once-in-a-lifetime opportunity," said Peter Wallman, who is the car expert at RM Auctions. "I think, unquestionably, it's the most famous car in the world." A radio station owner from the U.S. bought the car directly from Aston Martin for $12,000 in 1969 and he has kept it in his "James Bond Room" ever since. Jerry Lee decided to sell the car at auction in order to fund the foundation he founded in 2007 to stop crime. I don't know about you, but I think he could have been using that car to fight crime. Now, someone with a spare $4 million just bought the car but it's not immediately clear who the buyer was. My guess? Bruce Wayne. In any case, the buyer can now feel like he's James Bond as he's racing the car on a hairpin turn, and while he can't drop oil slicks behind him with the press of a button, I'm sure some further modifications can be made. If I'd bought it, the first thing I'd do would be to make the horn play the "Peter Gunn Theme."